Treat highlighted locks to the TIGI Catwalk Fashionista Blonde Tween Duo. Combining a radiance-reviving shampoo and conditioner, the duo work in tandem to eliminate yellow, brassy tones from blonde hair. Boasting a sulphate-free formula, the revitalising shampoo gently cleanses away dirt and impurities, whilst Violet, Pearl Extract and Rice Milk work in tandem to improve colour vibrancy and enhance shine. Expect luminous, luscious locks that are free from brassiness. Fortified with an innovative complex of Rice Milk, Violet and Pearl Extract, the nourishing conditioner helps to soften and detangle hair, as it eliminates unwanted brassy tones and delivers mirror-like shine to blonde, grey or white locks. 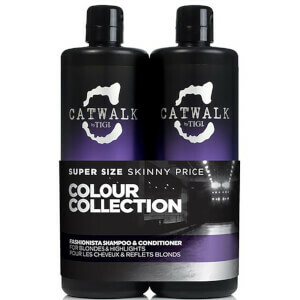 Tresses are hydrated and healthy-looking with ultimate colour brilliance. Shampoo: Work through wet hair, leave in for up to 10 minutes, then rinse. Conditioner: Apply to clean, damp hair from the mid-lengths to ends. Leave for up to 10 minutes, then rinse well. Shampoo: Water (Aqua/Eau), Sodium Cocoyl Isethionate, Sodium Lauryl Sulfoacetate, Cocamidopropyl Betaine, Glycol Distearate, Glycerin, Fragrance (Parfum), Sodium Chloride, Phenoxyethanol, Sodium Sulfate, Carbomer, Sodium Isethionate, Dimethiconol, Polyquaternium-10, PPG-9, Laureth-4, Mica, Disodium EDTA, TEA-Dodecylbenzenesulfonate, Amodimethicone, Triethanolamine, Sodium Benzoate, Lactic Acid, Citric Acid, TEA-Sulfate, PEG-45M, Magnesium Nitrate, Isopropyl Alcohol, Sodium Acetate, Trideceth-12, Cetrimonium Chloride, Cyclopentasiloxane, Methylchloroisothiazolinone, Silica, Magnesium Chloride, Methylisothiazolinone, Nonfat Dry Milk (Sine Adipe Lac/Poudre de Lait Écrémé), PEG-40 Hydrogenated Castor Oil, Trideceth-9, Hydrolyzed Pearl, Oryza Sativa (Rice) Bran Extract, Oryza Sativa (Rice) Germ Oil, Xanthan Gum, 1,2-Hexanediol, Caprylyl Glycol, Potassium Sorbate, Limonene, Linalool, Ext. Violet 2 (CI 60730), Titanium Dioxide (CI 77891). Conditioner: Water (Aqua/Eau), Cetearyl Alcohol, Trideceth-9, Lactic Acid, Behentrimonium Chloride, Fragrance (Parfum), Glycerin, Dimethicone, Phenoxyethanol, Dipropylene Glycol, Panthenol, Polyurethane-39, Disodium EDTA, Hydroxypropyl Methylcellulose, Potassium Chloride, PEG-45M, Amodimethicone, Magnesium Nitrate, Cetrimonium Chloride, PEG-7 Propylheptyl Ether, Silica, Citric Acid, Benzoic Acid, Dehydroacetic Acid, Methylchloroisothiazolinone, Magnesium Chloride, Methylisothiazolinone, Ethylhexylglycerin, BHT, Nonfat Dry Milk (Sine Adipe Lac/Poudre de Lait Écrémé), PEG-40 Hydrogenated Castor Oil, Hydrolyzed Pearl, Oryza Sativa (Rice) Bran Extract, Oryza Sativa (Rice) Germ Oil, Xanthan Gum, 1,2-Hexanediol, Caprylyl Glycol, Sodium Benzoate, Potassium Sorbate, Sodium Chloride, Stearamidopropyl Dimethylamine, Limonene, Linalool, Ext. Violet 2 (CI 60730).